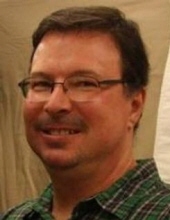 Michael Roy Jarrett, 52, passed away surrounded by his family members singing him into heaven on July 9, 2016 from injuries sustained in an automobile accident. Mike was born to Robert and Sally Jarrett on April 12, 1964, in Joplin, MO. He is survived by his mother, Sally, three sisters, Margaret (Keith), Bobbie (Rick), Patty (Doug), and a brother Tom (Linda). Mike is also survived by several nieces and nephews (and Sassy and Floppy, his cats). He was preceded in death by his father, Robert Jarrett. Mike graduated from Carl Junction High School and attended college at MSSU in Joplin and MU in Columbia. He proudly served his country six years in the US Navy on the nuclear submarines, Drum SSN677 and Newport News SSN750. Mike was an HP computer and copier sales representative. His computer savvy will be greatly missed by family and friends. Mike loved nature and had quite the forest of indoor and outdoor plants and his bird feeders. He shared on Facebook many pictures of the various flowers, birds, and critters around the family farm. He always said if he ever won the lottery, he had visions of restoring the old barn and fixing up the farm. Mike was always helping others and it is only fitting that the accident that took his life happened while helping a friend. Mike, you are loved and will be missed by a multitude of family and friends. Rest now, little brother! Funeral services will be held on Wednesday, July 13 at 2 PM at Simpson Funeral Home in Carl Junction. A visitation will be held Tuesday, July 12 from 6-7pm at the Funeral Home. In lieu of flowers, please donate to https://www.gofundme.com/2dpvtsxg (Michael Jarrett Funeral Expenses) or the Hope 4 You Breast Cancer Foundation. To send flowers or a remembrance gift to the family of Michael R. Jarrett, please visit our Tribute Store. "Email Address" would like to share the life celebration of Michael R. Jarrett. Click on the "link" to go to share a favorite memory or leave a condolence message for the family.